There are a few different ways to go about splitting and chopping wood. The way that you select will be dependent upon a few different factors including your personal situation. Is this for a homestead in the winter? A survivalist situation? Or a winter wood supply in an entirely different situation? Once you’ve determined what you’re going to need you can begin planning how you’re going to go about things. If you’re going to need an entire winter’s wood supply, you’re going to want a sharp ax that you’re comfortable swinging and a splitting maul. If you’re in a survivalist situation you may only have a hatchet but you can still get a lot done with a hatchet. It’s just going to take longer. What is the best AX for splitting wood? What length should firewood be cut? How long do you wait before splitting wood? What is the difference between an AX and a splitting maul? Before you begin, you’ll want to make sure that you have enclosed shoes (bonus points for steel-toed boots). Work gloves, protective eyewear, long pants, and long sleeves. 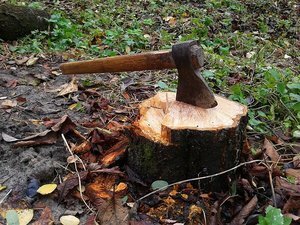 Splitting and chopping wood put you at risk for more than just splinters. You risk missing the wood and hitting your foot with an ax, pieces of wood bouncing off of something. This could cause it to hit your foot or throw wood chips at you, and other such incidences. So always wear protective gear when splitting or chopping wood. You’ll want to set up a workstation. Here you’ll want to have your ax, a wood splitting maul, and your wood supply that you’ll be working on. 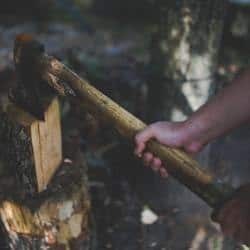 Your ax for splitting the wood is sharp and light enough weight that you can easily lift it and swing it up over your head so that you’ll have plenty of velocities to bring it down onto the wood. Most people prefer to use an old tree stump or a round that is up high enough that they can place the wood on the stump or round to split it. This is helpful as it prevents the blade of the ax from hitting the dirt and becoming dull. If you have rounds or simply large pieces of wood that need to be split or chopped into smaller sizes, you’ll want to look at the end of the wood and find the grain. The grain is made up of the rounds and lines that you see in the ends. Set the wood up so that the easiest to see grain is on top. The goal here is to try to hit a piece of the grain with the ax and break it down so that the wood splits readily into another piece or into kindling. Some pieces are going to be more difficult to split than others. It will depend on how green or wet the wood is, and the type of wood. It will also depend on the size of your ax, sharpness and your strength. Raise the ax up over your head and swing down into the piece of wood with all of your strength. If you hit it just right with the grain, it should split into two pieces of wood. If a piece simply won’t split, place your maul on the piece of wood and using the back of the ax blade tamp the maul down a bit. Then, you can swing a hammer, sledgehammer, or the opposite end of your ax blade onto the maul and hopefully break the piece of wood. You can also simply swing the maul as you do the ax and hit the wood. Depending on how green the wood is, this may or may not work to split the particular piece for you. Some pieces are just naturally more challenging than other pieces. Don’t despair, the more you try, the more you’re going to get the hang of it. Know that the persistence will pay off. Each time you hit the piece of wood you’re weakening the fibers and with perseverance, it will eventually break apart. There are many different axes on the market today. Choose an ax that is easy enough for you to lift and manage without injuring yourself. Be sure that your ax blade is plenty sharp and learn how to properly sharpen it if you’re going to be using it often. The more familiar you are with an ax, the easier it is to use. The length of your firewood will be dependent on the size of your wood stove, fire pit, or fireplace. Some wood stoves can take lengths that are up to 3 feet while others might only take a 1 to 2-foot piece of wood. Measure your wood stoves capacity by opening the door and sticking a tape measure inside. The end of the tape measure should not quite touch the back of the wood stove. Measure at least 2 inches inside of the door. This should give you a fairly good idea of how long your wood can be cut and split into. Most wood stoves will take about a 2-foot log easily. Some, however, are smaller so always measure before you split or chop the wood. If you’re in a hurry, you may have to split your wood before it’s properly seasoned. Wood should season (dry out) for at least a season. If the wood is felled in the spring, allow it to sit and dry out until the end of summer. Remember, the drier the wood, the easier it is to split or cut. Different woods have different levels of hardness as well so keep this in mind too. A maul is heavier and wider than an ax. It’s typically not as sharp as an ax is either. Wood that has knots in it is going to be more difficult to split. Whenever possible, split wood around the knots for easier splitting. Always split with the grain of the wood. Take some breaks. Splitting wood with a maul or ax requires a lot of shoulder muscle and you’re going to be sore. 5.11 Men’s TacLite Pro Review – How Reliable Is This Pant?